When a recipe calls for some sort of crumb topping, I know right away it will be a winner. There's just something so special about the combination of brown sugar, butter and cinnamon. Just like in my favorite Old-Fashioned Crumb Cake, the crumbs are what makes the whole thing work. If you're like me, you'll be tempted to pick off all the larger crumbs and devour them on the spot. I won't judge you if you do. Serve these for breakfast or brunch, or for an after-dinner treat with a cup of coffee. For the short time they lasted in our house, I took one for breakfast in the morning and it held me over until lunchtime. 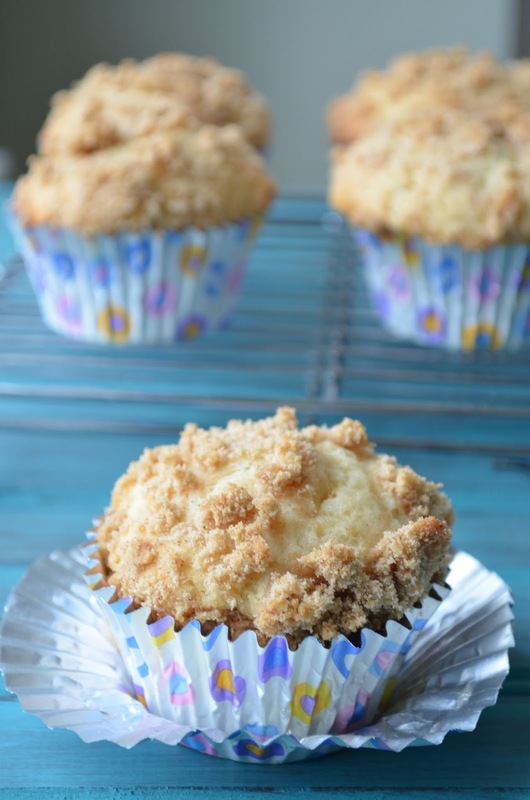 The hints of streusel layered throughout the muffin are also a welcome surprise when you bite in. Enjoy! Preheat oven to 350°F. Grease muffin tin with cooking spray or line with cupcake liners. Prepare the streusel topping by combining all ingredients in a small bowl, using a fork to cut the butter evenly into the dry ingredients until well incorporated (it should be the consistency of wet sand). Set aside. In the bowl of a stand mixer fitted with the paddle attachment, beat the butter, oil and 1 cup sugar on medium speed until well mixed. Add the eggs, one at a time, beating well after each addition. Reduce mixer speed to low, and then gradually beat in the flour mixture, sour cream and vanilla just until combined. 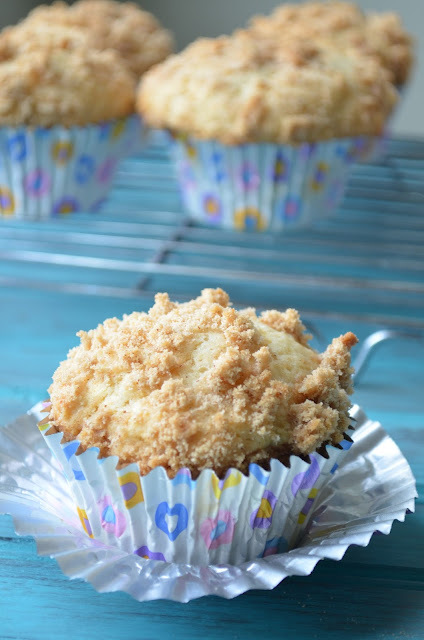 Layer the batter and streusel in the prepared muffin tin by spooning a portion of the batter, then a sprinkle of streusel, topped by another portion of batter and a final sprinkle of streusel on top. Bake muffins for about 15-20 minutes, or until a toothpick inserted comes out clean. Remove muffins from oven and let cool in tin for 5 minutes before transferring to a cooling rack. I love a good crumb topping and I might be guilty of just eating the tops! Thanks for linking up with What's Cooking Wednesday!